Finishing Touch provides a top class, mobile car detailing service in Tulsa and surrounding areas. We use only top quality products to get your car looking great after one of our detailing visits. If you have difficulties getting enough spare time to drop your car off, we can come to you. Our mobile detailing service is 100% self-sufficient. We do not need access to a water or power supply. This means we are able to detail your car at any location. 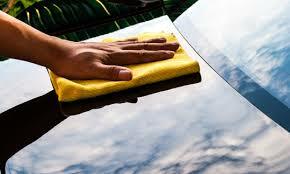 Many of our loyal customers get us to call to their workplaces, so that we can detail their cars while they work. Our car detailing prices depend on the level of detailing required and the type of car you have. Our car detailing pricesare among the most competitive to be found. We can do a personal detailing starting from just $35. For that, we give your entire car exterior, including wheels, tires and all windows, a hand wash. We hand dry the car after washing. We vacuum the interior and shampoo the mats. We also make our mobile car detailing service available to truck and boat owners. Want your fleet cleaned? That’s no problem. We can do that for you. With over 12 years experience, we provide a service that no one else can beat. Our fleet prices start from as little as $8 for an exterior wash for a small vehicle. We can do exterior only or exterior and interior fleet detailing. If you have special requirements, just give us a call and we will prepare a customized quote. Our car detailing pricesare hard to beat, so why not give our service a tryout today. It’s easy to make an appointment. Just call us on 1.918.724.WASH and we can arrange a mutually acceptable time to call to your desired location. Alternatively, you can email rudy.larson@yahoo.com.